We’re always looking to help you out by adding value wherever we can at Austim. Our expertise and equipment allows us to carry out a wide variety of handy services on-site, saving you time and money. We have a full-time qualified timber machinist on staff with a range of handy equipment. Ask our sales team about what you need for your unique requirements! If you intend to use your timber externally, we recommend you apply some form of protection to improve stability and longevity. For instance, the underside of timber decking is rarely coated because it’s a messy and time-consuming task to carry out on-site. At Austim, we have a surprisingly cost-effective solution. Our two coating machines are capable of applying oil to all four faces of timber boards, be it timber cladding, timber decking or screening. Typically, we would recommend either a single coat of Cutek CD-50 clear in our factory to coat the timber all round followed by one or two clear or tinted coats on-site. Or if you desire a water-based product we would recommend a pre-coat in Intergrain Pre-Coat, which can be followed with two top coats of Intergrain Ultradeck or Intergrain Natures Timber Oil. 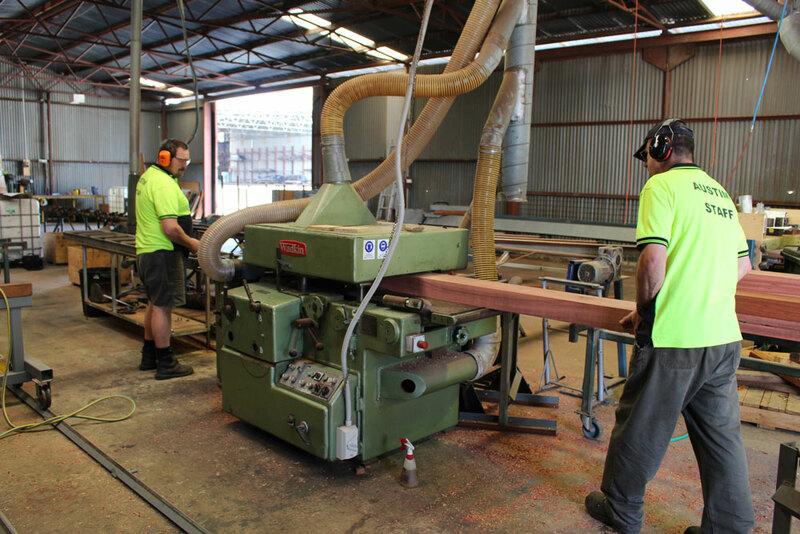 Austim don’t just carry and source the most exceptional timber supplies Perth wide (from merbau timber to timber decking) we provide the most complete timber service around. Just ask Austim!